First, the Yuan-Ti Histachii. My version of this creature (a 1/2 Challenge monster) comes from the one found in the 1993 2e Monstrous Compendium, although this creature first appeared in the Kara-Tur campaign setting, and was originally printed in that product’s Monstrous Comendium Appendix. The histachii is a former human, transformed into a reptilian humajoid by a foul yuan-ti mixture. They serve as slaves to the Yuan-Ti, guarding prisoners, hunting, and other tasks. Of course, they can also serve as cannon fodder. 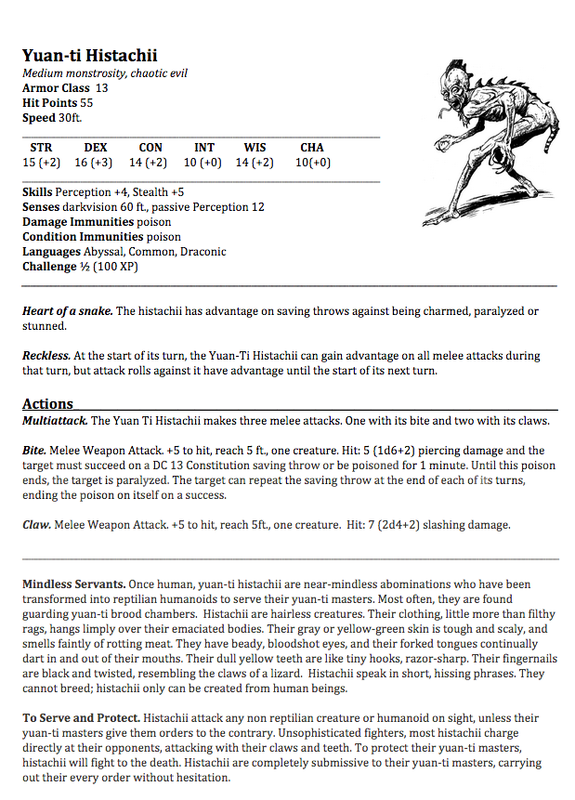 I wanted to make this creature available for 5e because the Yuan-Ti entry in the MM is missing (in my opinion) a suitable low challenge grunt for low level PCs. Sure, the Yuan-Ti Pureblood is there, but in my opinion it serves a different purpose. You can find the Yuan-Ti Histachii here. The following monsters are a pair of undead, the Skeleton Warrior, and the Huecuva. The skeleton warrior was a nasty monster back in the AD&D days of yore. (It also made for a memorable character in a classic episode of the D&D cartoon). 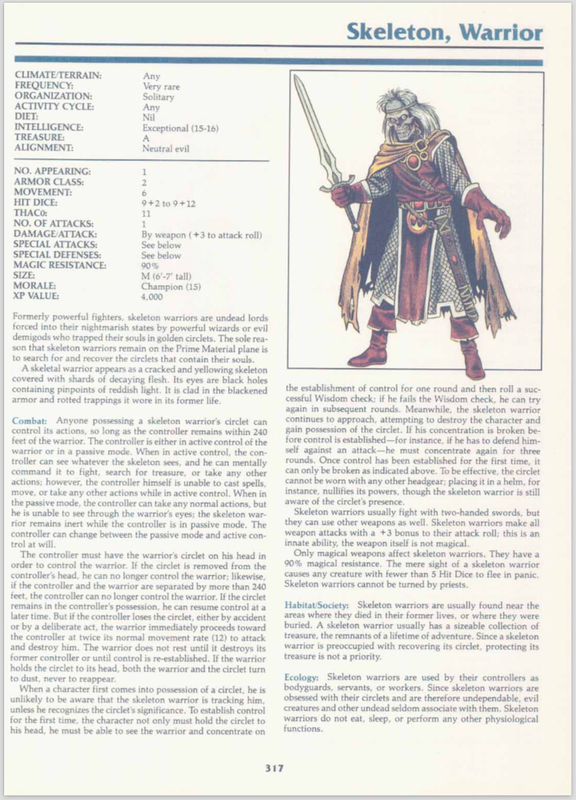 It first appeared in the Fiend Folio for 1e, then reappeared in the Dragonlance Monstrous Compendium appendix, and eventually ended its AD&D appearances in 1993’s 2e Monstrous Compendium. Almost a bit lich-like, the skeleton warrior has an interesting backstory… its soul was trapped long ago in a circlet by powerful demigod or an evil wizard. Their only raison d’etre is to search for and find the circlet containing their souls. 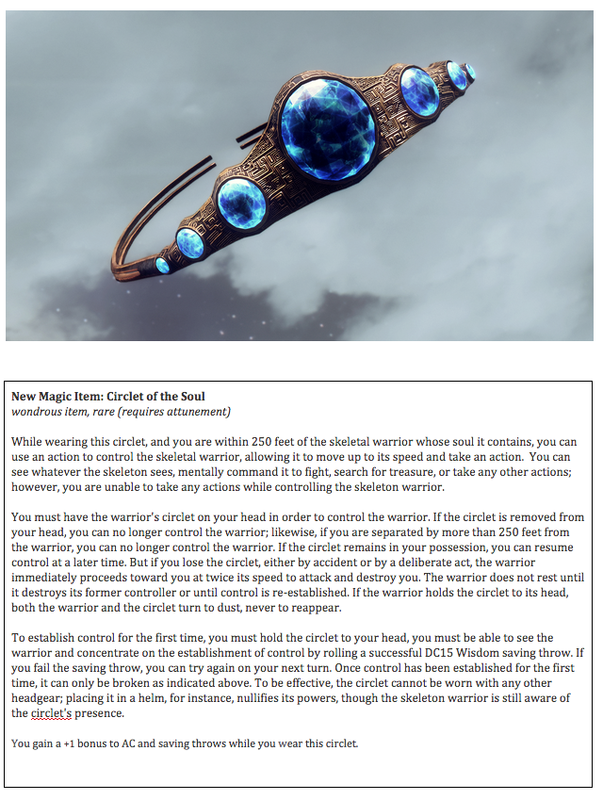 The circlet can be used to fully control the skeleton warrior, but if the circlet gets lost watch out… because the skeleton warrior will stop at nothing to kill its former controller. Granted, it’s a very situational type monster. But I thought it was a neat backstory. Neat enough that I wanted to see it in 5e. In 2e term, it was a 9+2 to 9+12 HD creature. In 5e I made it a Challenge 13 monster, since the guy is loaded with immunities and can’t even be turned. He’s a nasty critter. 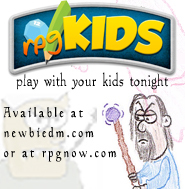 Now, one of the things not described in the AD&D version is the magic item which makes up this monster’s story. So I added it to my write up. It’s basically a golden circlet that grants a +1 to AC and saving throws, along with the skeleton controlling abilities. Download the Skeleton Warrior here. The final monster is a neat one, and a bit of a D&D trivia oddity. The huecuva, or heucuva, depending what you’re reading. You see, it’s one of the few D&D monsters (maybe the only one) that managed to have an editorial error slip through the cracks and become canon. 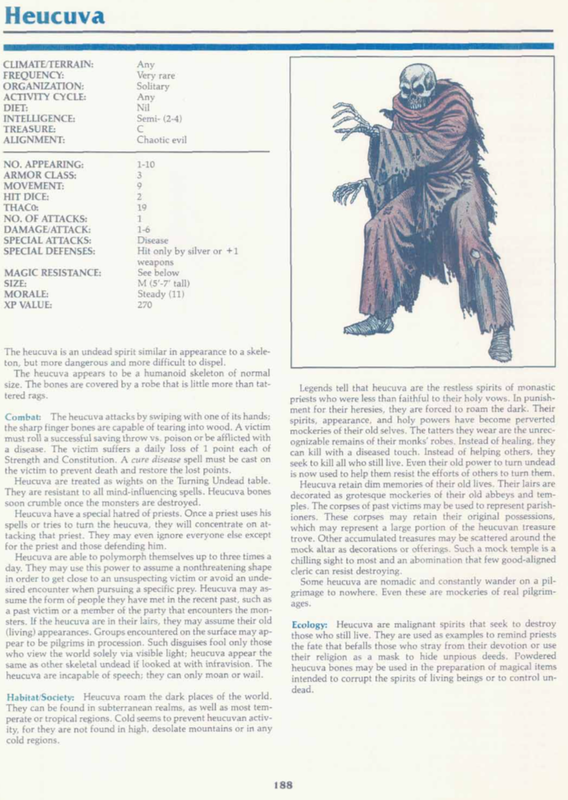 In the Fiend Folio, it was huecuva, and later it became a heucuva due to a typo. The rest is history ( and you can read more about this on page 6 of Dragon Magazine issue 168). In D&D terms, it’s described as an undead spirit similar in appearance to a skeleton. Legends tell that they are the restless spirits of monastic priests who were unfaithful to their vows and now face eternal punishment, roaming, killing, and making mockeries of their past lives. It attacks with its claws, causing disease to the unlucky ones it manages to hit. 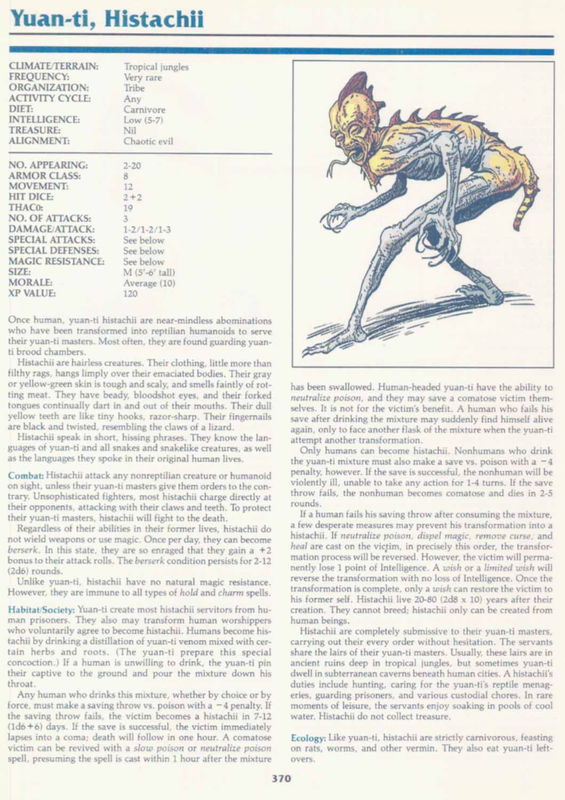 In the Fiend Folio it actually caused terminal renal disease! They could also polymorph themselves into other types of creatures, and are resistant to mind controlling spells. 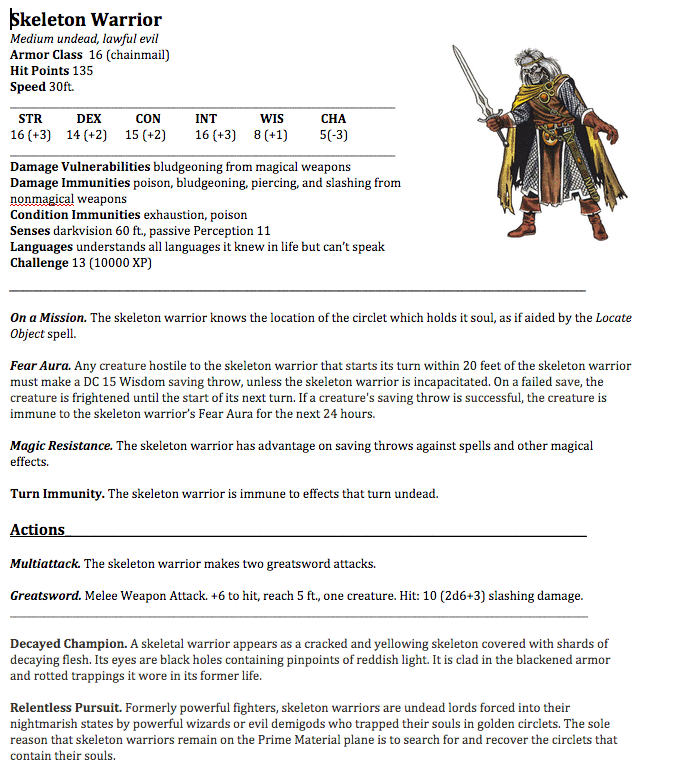 And yes, I know there was a 4e template for this creature, but it seemed to ignore this whole aspect of the monster, so again, I’m working off the AD&D versions. 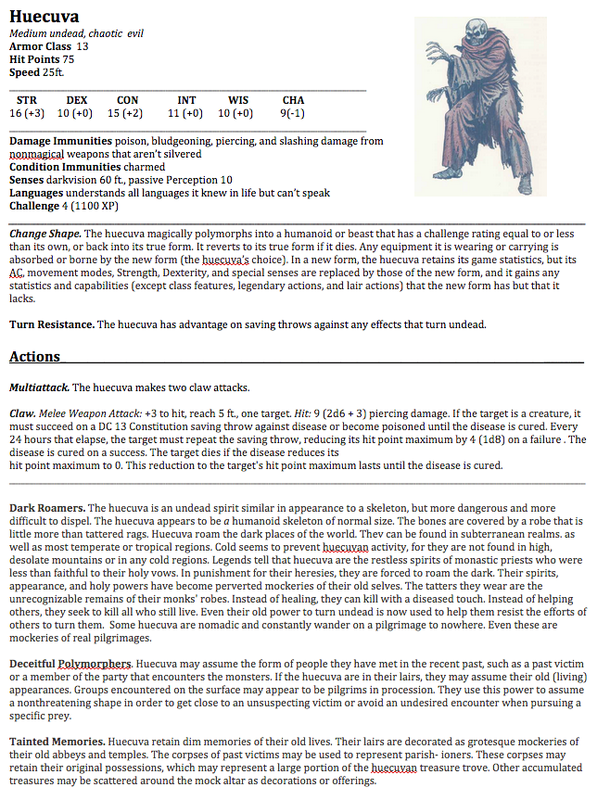 In 2e it was a 2 HD creature, I made it a challenge 4 creature for 5e. A shape changing undead that can cause disease and has advantage resisting turning? I’ll take that! These monsters haven’t been playtested yet. I created them using the guidelines in the DMG, and from reading their older stat blocks. Partly art… partly science. Let me know what you think! But then I read the whole thing and they call them Skeleton Warriors and Skeletal Warriors, so whatever! Thank you for sharing your creations. The skeleton warrior is one of the creatures included in Fifth Edition Foes so it’s interesting to compare the results. They decided to give it lair actions too. Did I come close to the 5th Edition Foes version? Their version is CR14 so just overall tougher opponent. Stats are higher (20 Str for example), it gets three attacks with a great sword not two and it’s ranged bow attack can cause fatigue. It also has lair actions like I mentioned above-one of them is the fear effect that you have. So overall same type flavor just slightly higher CR.